Newsgur USA: Why what Trump said about Putin outraged all US? Why what Trump said about Putin outraged all US? For the first time since Donald Trump came to the presidency of the United States, the two parties, Democrat and Republican, united around a single idea: the rejection of the tycoon's attitude with the Russian president, Vladimir Putin. Given a choice between the intelligence services of their own country and Russian President, Trump refused Monday to condemn Moscow's interference in the US presidential campaign, sparking outrage in Washington by the conciliatory attitude he had with the Russian president. After a two-hour meeting, the two leaders showed their willingness to redirect relations between their countries. The two leaders emerged from their meeting in Helsinki expressed their willingness to cooperate on global challenges, after talks on a range of topics that included from Syria, Ukraine and China to the imposition of tariffs and the size of their nuclear arsenals. But in Washington, lawmakers did not hide their irritation at Trump's gesture of accepting Putin's word by denying any interference by Russia in the 2016 presidential election, as American intelligence services claim. Putin "just said that it is not Russia. I will say the following: 'I do not see any reason for it to be'," Trump said, implying that he trusted more in the Russian president's word than in the conclusions of his own services. 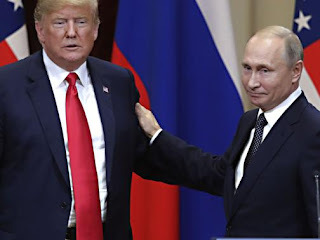 During his flight back to the United States, Trump was able to verify the consequences of his attitude towards Putin, which earned him criticism even among the ranks of his formation, the Republican Party. "Today's press conference in Helsinki is one of the most embarrassing performances of a US president that we can remember," said Republican Senator John McCain. Trump had to intervene to try to calm things down. "I have an IMMENSE confidence in my intelligence staff. But I will say that President Putin was very firm and strong in his refusal," he said on Twitter from the plane in which he was traveling back to the United States. "But to build a bright future, we cannot focus exclusively on the past," he added. The American billionaire, who has been in power for 18 months, has long shown his intention to establish a personal relationship with Putin, an ex-official of the KGB that runs Russia since 2000. Trump must understand that "Russia is not our ally," declared the leader of the Republicans in the US Congress, Paul Ryan. The leader of the Democratic opposition in the Senate, Chuck Schumer, accused Trump of having a "dangerous and weak" behavior during his meeting with Putin. Nancy Pelosi, the leader of the Democratic opposition in the House of Representatives, spoke on her part of a "sad day for the United States." On the eve of the summit, the investigation into Russian interference in favor of Trump in the 2016 campaign had a spectacular new episode with the imputation of 12 Russian intelligence agents, accused of hacking the computers of the Democratic Party. "That investigation is a disaster (...) that had negative consequences on the relations of the first two nuclear powers in the world," Trump said at the joint press conference with Putin. "We had an extraordinary campaign and that is the reason why I am president," he added. In an interview for the US Fox News channel, Putin asked that the relations between his country and the United States not be "taken hostage" by the investigation into the alleged Russian interference in the elections. "I'm not interested in this issue a bit," Putin said. "These are internal political games of the United States." The Russian president thus gave the reason to Trump, who, shortly before the summit, had stated in a surprising tweet that the tense relations between Washington and Moscow are due to "years of stupidity on the part of the United States" and "the hunt for witches "of the FBI, which investigates the Russian influence in the US presidential elections. Eager to give a positive image of their meeting, the two leaders insisted on their desire to improve bilateral relations. "I hope we have begun to understand each other better," said Putin, who spoke of "very successful and very useful" conversations, while Trump highlighted a "direct, open and very productive dialogue". Referring to the rumors about the existence of compromising material against Trump in Moscow, Putin declared: "It would be difficult to imagine a greater absurdity! Put those stupid things off your heads." Before the summit, many diplomats and analysts feared that the US president would make a series of concessions to Putin, on issues such as the war in Syria or the annexation of Crimea by Russia. But the two men did not disclose many details about the content of their conversations.